The Vodacom Bulls extended their undefeated streak against the Sharks to nine matches after claiming a 19-16 win in Durban on Saturday. CRAIG LEWIS reports. For large parts of this contest, it looked as if the Sharks may finally have had the beating of the Bulls. 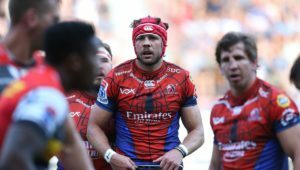 They last claimed a Super Rugby victory against the Pretoria-based side way back in round one of the 2014 season. Yet the fact remains that the Sharks once again lacked composure in the big moments, with flyhalf Handré Pollard slotting a late penalty to lift the Bulls to a fourth win of the season. 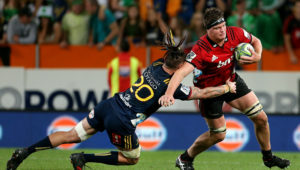 The game had looked to be heading for a draw when Sharks centre André Esterhuizen scored in the 71st minute, but the Bulls pack then fronted up to win a crucial scrum penalty with just a couple of minutes remaining. Pollard stepped up and slotted the match-winning kick. Having trailed 6-3 after a forgettable first half, the Sharks made the perfect start to the second half when Dan du Preez finished off an important try virtually straight from the kick-off. 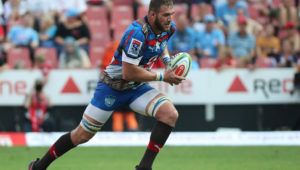 It was clear that the Sharks would be looking to up the tempo and aim to build some continuity in the humid conditions, but cue the influence of Bulls No 8 Duane Vermeulen, who completed a couple of crucial steals at the breakdown. Soon after, Rob du Preez dropped off a tackle on Burger Odendaal, with the linebreak ultimately leading to the simplest of tries for Jesse Kriel, and suddenly the Bulls were back in front. 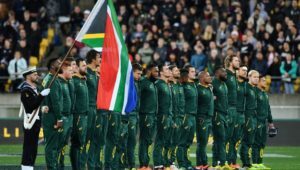 Those two tries had the potential to spark the clash into some much-needed life, but proceedings were spoiled by an ugly scuffle between hookers Akker van der Merwe and Schalk Brits, which resulted in both players being shown a red card for punches thrown. Once order was restored, Esterhuizen looked as if he could have won the game for the hosts with his late try, but it ultimately was once again not to be for the Sharks against the Bulls. When these two teams met earlier in the season, the Bulls made a powerful statement from the outset as they dominated the gainline and collisions. This time around, though, it would be the Sharks who delivered a few massive defensive hits in the early exchanges. This allowed the Sharks to build some confidence – as indicated by the decision to turn down shots at goal twice and rather set up lineouts – but they lacked the necessary execution on each occasion. 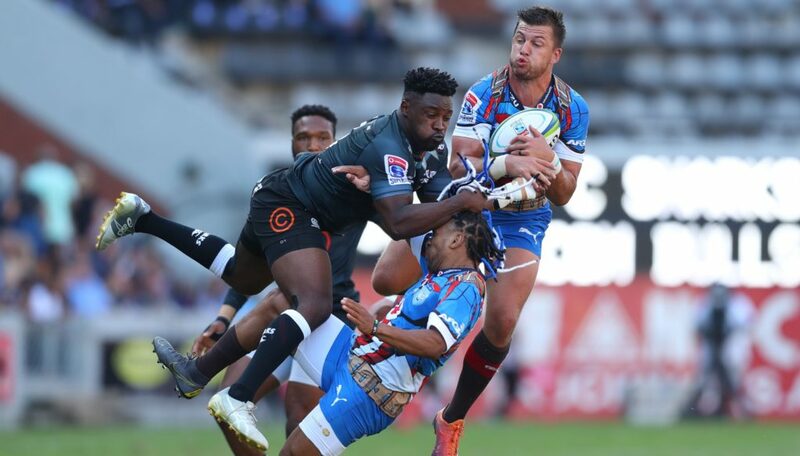 Errors would continue to haunt the Sharks despite an industrious start, which told the story of a scrappy first half in hot conditions in Durban, with neither side able to assert any real control on proceedings, while making as many as seven handling errors each. Ultimately, after a drama-filled second half, the Bulls would make the decisive strike late in the game to leave the Sharks heart-broken yet again. It’s been a typically tough South African derby so far with the Bulls 3 points up at the interval. Sharks – Tries: Dan du Preez, André Esterhuizen. Penalties: Du Preez (2). Bulls – Try: Jesse Kriel. Conversion: Handré Pollard. Penalties: Pollard (4). Sharks – 15 Aphelele Fassi, 14 Lwazi Mvovo, 13 Lukhanyo Am, 12 André Esterhuizen, 11 Makazole Mapimpi, 10 Robert du Preez, 9 Louis Schreuder (c), 8 Daniel du Preez, 7 Jacques Vermeulen, 6 Luke Stringer, 5 Hyron Andrews, 4 Ruben van Heerden, 3 Coenie Oosthuizen, 2 Akker van der Merwe, 1 Tendai Mtawarira. Subs: 16 Kerron van Vuuren, 17 Thomas du Toit, 18 Khutha Mchunu, 19 Gideon Koegelenberg, 20 Philip van der Walt, 21 Grant Williams, 22 Kobus van Wyk, 23 Curwin Bosch. Bulls – 15 Divan Rossouw, 14 Cornal Hendricks, 13 Jesse Kriel, 12 Burger Odendaal, 11 Rosko Specman, 10 Handré Pollard (c), 9 Embrose Papier, 8 Duane Vermeulen, 7 Hanro Liebenberg, 6 Ruan Steenkamp, 5 Eli Snyman, 4 Jason Jenkins, 3 Trevor Nyakane, 2 Schalk Brits, 1 Lizo Gqoboka. Subs: 16 Corniel Els, 17 Simpiwe Matanzima, 18 Conrad van Vuuren, 19 Jannes Kirsten, 20 Tim Agaba, 21 Ivan van Zyl, 22 Manie Libbok, 23 Johnny Kotzé.